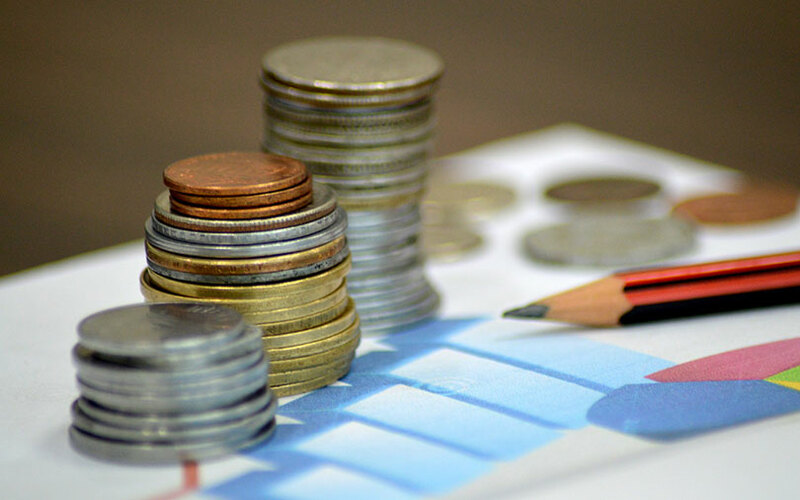 Every seventh startup that got funded last year had an India address even as overall funding activity was tepid for the first time in six years, says the Global Startup Deal Report for 2016 released by VCCEdge, the data analytics arm of News Corp VCCircle. Only Europe and Canada were able to buck the weak funding trend in a year that saw a 12% drop in the number of deals and a massive 25% drop in their value. The heady optimism of 2015 gave way to caution, correction and investor wariness in 2016, with investments falling and enthusiasm for startup funding waning significantly,” says the report, prepared in collaboration with VentureSource, Dow Jones' global database on companies backed by venture capital and private equity. This risk-aversion, it says, was driven largely by a mix of global economic and socio-political changes. At least four major global factors influenced investment trends. First, in January, oil prices hit their decade-low and continued to be volatile throughout the year. Second, in the same month, the Bank of Japan announced its negative interest rate policy for reserve funds parked with it. Third, in June, in a shock development, the UK voted in a referendum to walk out of the European Union. The move battered the pound and cast a shadow on the future of the European economy. But the biggest shock was yet to come. In November, businessman-turned-politician Donald Trump was elected as US president, sparking panic and widespread fears that undue protectionism and hostile immigration laws will result in a global trade slowdown. Even as Trump got elected to the White House, the same evening, the Indian government demonetised 86% of the currency in circulation in a bid to clamp down on black money. That sucked out liquidity from the system, bringing significant parts of India’s cash-dependent economy to a standstill and hurting growth. Even as the US continued to dominate global startup funding activity, with a third of the deals taking place there, its overall share has slipped since 2012, when more than half the deals were struck there. China, on the other hand, has seen its share climb four times during the same period. Both countries together cornered more than 70% of the total funding value, with the US getting 43% and China walking away with 30%. Yet, both these geographies saw overall deal activity decline in 2016, with only Europe and Canada seeing an uptick. 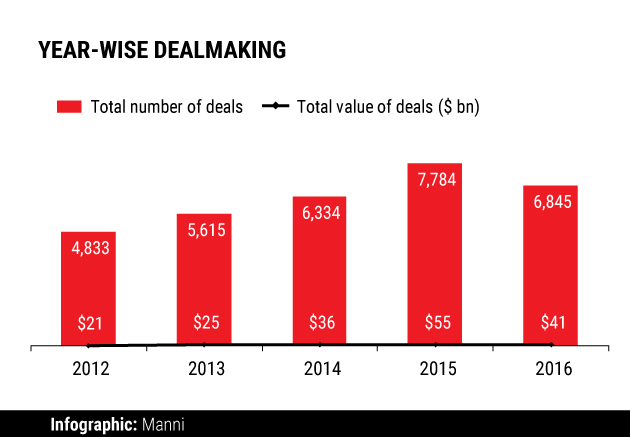 India put up a better show as far as the number of deals goes—from less than a tenth in 2012, its share was close to a sixth. The two countries also dominated startup deal activity in the business and financial services (BFSI) sector, which saw a little under 1,600 deals worth $10 billion during the year. While the US dominated in terms of the number of deals, China came out tops in value terms. Canada emerged as a rising star, recording 97% growth in deal volume and 15% in value terms. The overall gloom took its toll on India, which saw the maximum decline in investments in the information technology space, and accounted for the lowest share of investments in healthcare. The consumer services sector continued to be dominated by China, even as it saw the steepest decline in deal value. Even in Canada and Europe, which saw an overall growth in the number and value of deals in 2016, deals in consumer services fell. Deal activity and value in Europe declined by 3% and 11%, respectively, for the industry. Two-thirds of all startup funding deals in India were angel- and seed-led, shows the report. In fact, as much as 55% of all angel and seed deals globally were inked in India. Series A investments in India accounted for merely 23% of all deals, which was significantly lower than other geographies. In most other geographies, Series A funding accounted for close to 60% of the overall number while angel and seed deals were less than a fifth of the total. By value, early-stage funding made for nearly a sixth of total startup deals in India. While the share of seed and angel investments ranged between 2% and 7% of total startup investments globally, in India the figure stood at close to 17%.